We install flagstone and pavers for walkways, patios and driveways. We install segmental wall for walls, steps, and firepits. A professional trained and certified installer will do your installation. 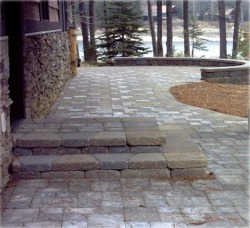 Steps made of rock or pavers get you where you need to go with professional installation. From round to conventional, we can build what you desire. We install Basalite Pavers and wall. Peruse their website for ideas, colors, and styles or look through our Portfolio. Paver Cleaning and Sealing: Protect your investment and seal it! Revitalize your older pavers and protect your new ones.